A perfect spot to enjoy the waterside views. Plantings of Vardar Valley Boxwood, Autumn Bride Coral Bell, Dwarf Summer sweet, Inkberry and Ornamental Grasses are used around the patio. These selections bring evergreen foliage, fragrance and movement to the setting. Native plantings of Bottlebrush Buckeye, Christmas Fern, Sedges are mixed with Hosta and Epimedium to add color, texture and interest to this hillside. The new beds are arranged in large undulating curving swaths around beneath the existing trees. A few understory trees were added for their flowering attributes and to help the tall existing trees tie into the landscape. 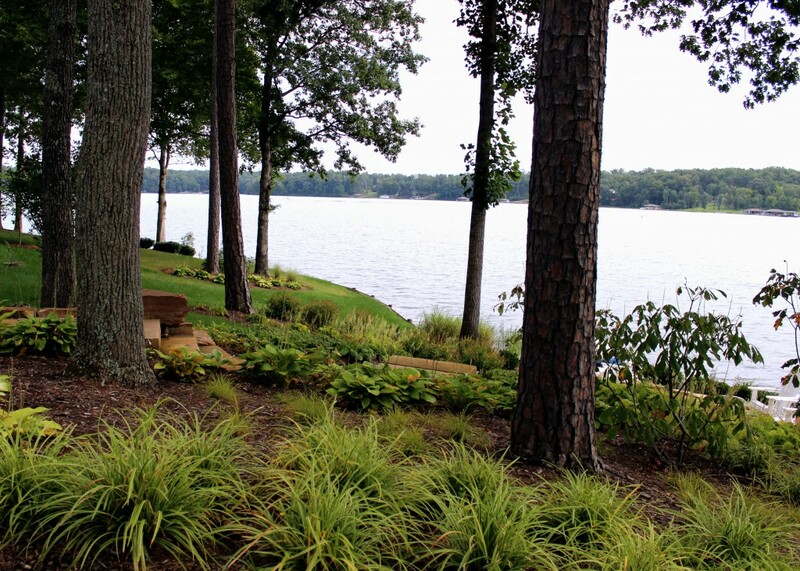 Care was taken to keep the majority of the plantings low so as to not interfere with the view of the water. These large beds also work as a natural filter and erosion control for water coming from the homes above. Perennial Geraniums, Autumn Bride Heuchera, Carex pennsylvanica were planted in massed drifts along this hillside. Vardar Valley Boxwood and Otto Luyken Laurel are used to add some height and evergreen foliage to the planting. A closer look at this stone stair constructed with Tennessee Crab Orchard Flagstone slabs. 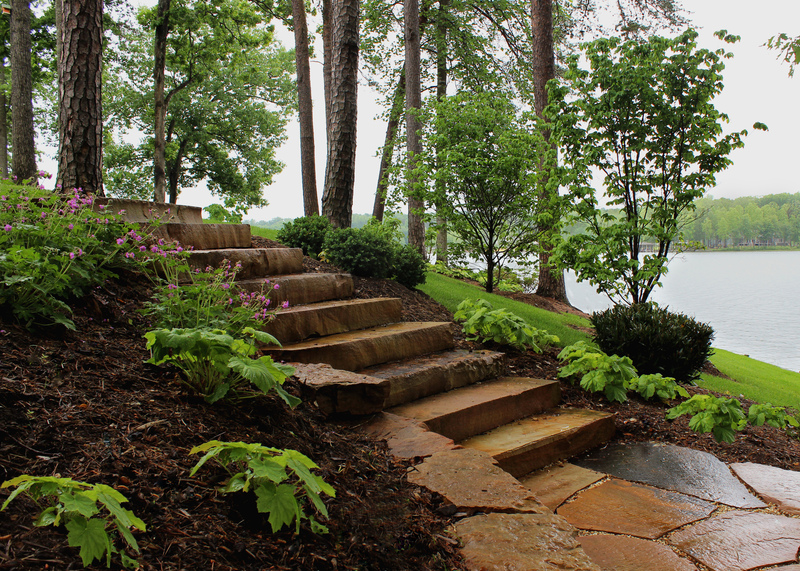 Thick slabs were snap cut and carefully arranged to create this attractive walk to the water. This large patio space is constructed to be as environmentally friendly as possible. 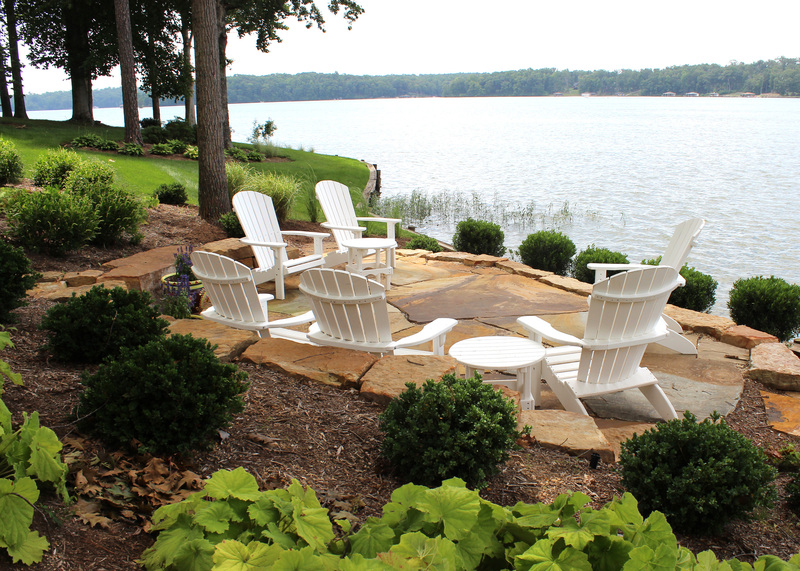 Large slabs of Tennessee Crab Orchard flagstone are set on a deep gravel base to create a permeable patio. The spaces between the slabs are filled with small rounded stones which blend nicely with the color of the stone and allow rainwater to flow between them to the gravel bed beneath the patio. Planting beds surrounding the patio space are densely planted with a mix of perennials, flowering shrubs and evergreens. 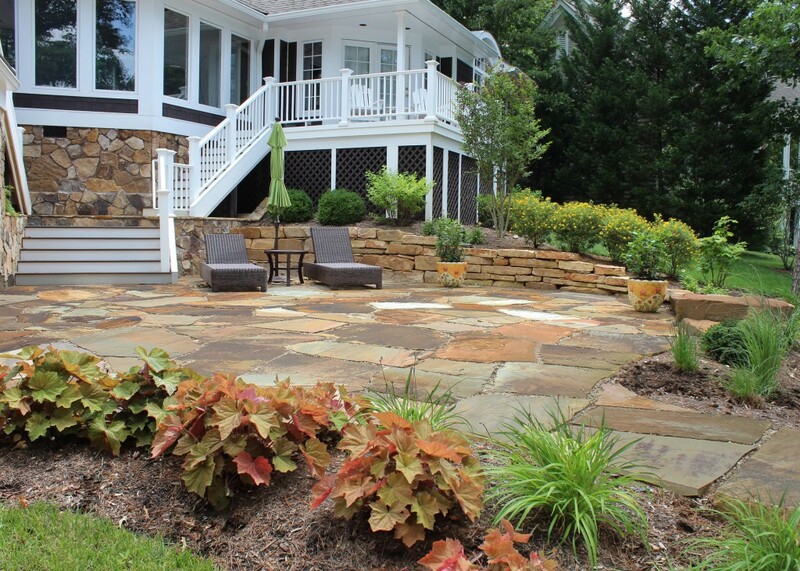 The plantings were carefully chosen so their colors also echo and complement the stone colors. 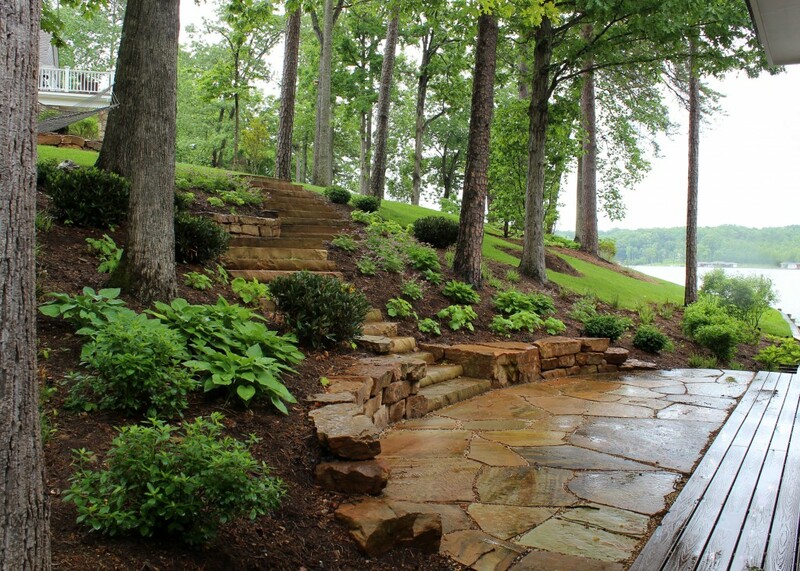 A series of steps and walls help create an easily traversed and enjoyed garden. 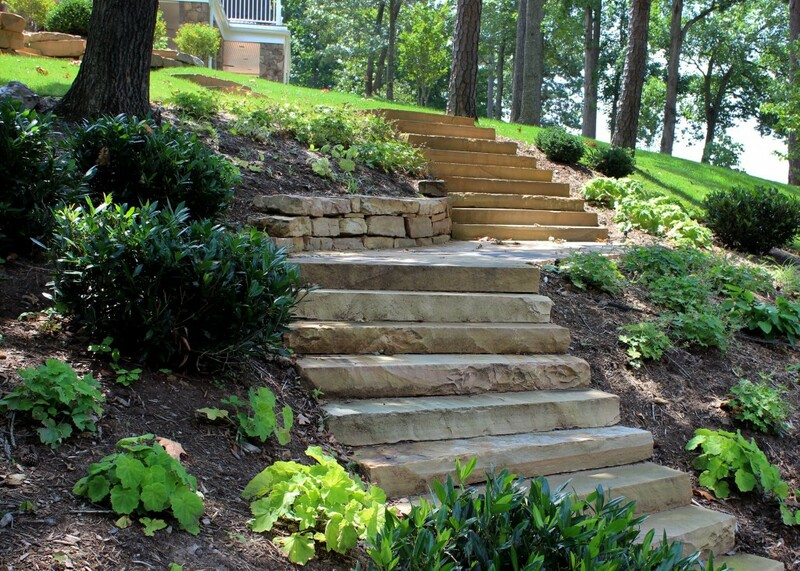 The blocky sandstone was used to create durable, attractive and sturdy retaining walls for the steps to pass through. 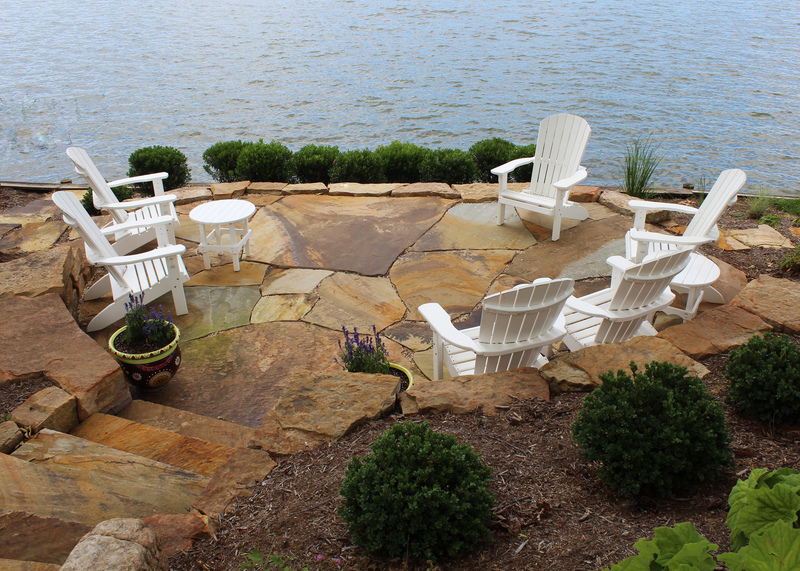 Tennessee Crab Orchard flagstone was used for the walkway and thick slabs were used to create the steps. 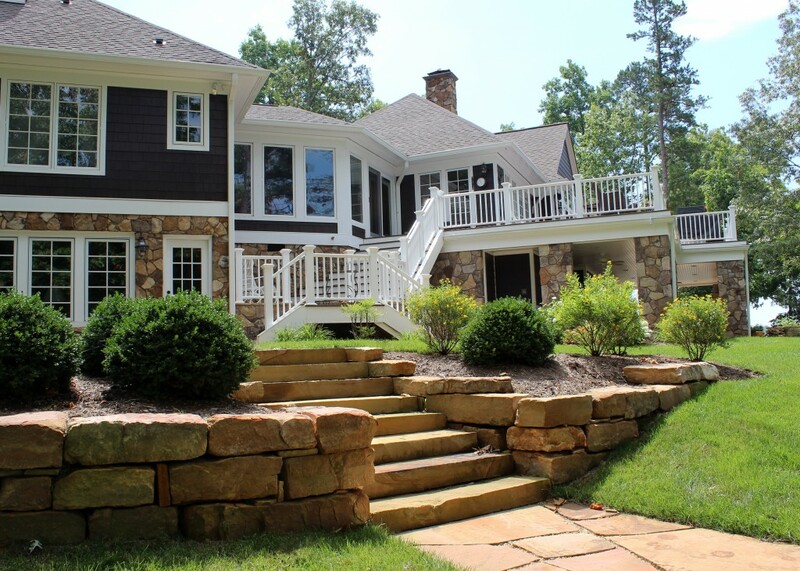 Plantings above the walls feature Green Beauty Boxwood and Sunny Boulevard Hypericum.